The only true waterfront rental house with water views from almost every room and a private newly refurbished dock, 10 steps from your door! Very relaxing and natural decor-everything blends in with the beautiful water that is just steps from your back door. When you enter the king size master suite, you will be overwhelmed by the view. It has its own bath and a large glass-walled view with access to a private deck. Enjoy watching dolphins, boats, sunrises and sunsets on the calm waters of Taylor Creek. The newly remodeled second master suite has a queen bed with full bath and water view. The kitchen has an open floor plan with a breakfast bar and a large pine dining table that seats 10 and allows everyone a view of the wild ponies and sailboats. The second story deck with spiral stair affords gorgeous views all the way to the Atlantic ocean and Shackleford Banks-a perfect sunset watching spot for cocktails! You can walk or bike to town everyday or night for lunch and dinner in Beaufort's historic downtown where there is no shortage of restaurants and ice cream parlors. This is a kid-friendly town where streets are all flat and perfect for bicycling. We fell in love with this town while dropping our oldest son off at Camp Seagull in 2001. We have brought our 4 boys here since then and they have all grown up loving Beaufort as well. 5 of us got certified for scuba here at Discovery Dive and we tend to make every vacation a diving opportunity. We hope to retire here one day-if we can ever get our boys out of college! We know you will fall in love with Beaufort too! Carrot Island is right across the creek and you can watch the ponies and dolphins from almost any window Private.Dock in backyard that does not even require you to cross the street!. 1 level living. Large windows and open floor plan bring the views all the way into the house. Deep water dock for serious boaters and sailors. You can see the water from the front door all the way through the house. When you walk up the spiral staircase to the second floor deck you know you are living large! Using a boat or Kayak, The sandy Beaches and hillocks of Carrot Island ( Nature Preserve) are directly across Taylor Creek. Look but do not touch or feed the Wild Ponies and look out for Dolphin. From the observation deck you can look over the Nature Preserve directly out to Beaufort Inlet, Fort Macon and the Atlanitc Ocean . People and boat watching is a favorite pastime after a day on the water. icemaker, water and ice in the door. Generous side by side type. Perfect place for us to stay. We always have a good time and love the beauty of 1512 Front St. Look forward to our next visit. Beautiful home with exquisite harbor views!! Lovely home! Spacious and beautifully decorated. Well maintained and comfortable. Great location within walking distance of downtown Beaufort. Wonderful views of harbor!! Will definitely be back! Greatest Ever/ unforgettable vacation/ outstanding owner willing to help make your stay stress free. Beautiful location, home is very accommodating for family of 4 or more. With easy access to Taylor's Creek and a short walk into town.The views are amazing. Would recommend it to you and your family! So glad you had a great time in our waterfront home. We love it there too! We hope you will return again soon...fall is a beautiful time in Beaufort! Thank you so much to the Breakells for sharing their beautiful home with us. My husband and I enjoyed our third trip to Front Street with our son, grandma, and the dog, and we all felt the relaxation set in upon arrival. Rain or shine, you will be comfortable in this home. There is a large area with expansive views of Taylor's Creek and Rachel Carson Reserve with the horses and waterfowl, plenty of seating for meals in the dining area, and a cozy TV room. Even on days when we had storms, we all loved the chance to read in our favorite spots. We appreciated, as always, the privacy of all of the bedrooms being spread out, and we love the 3 bathrooms (two associated with Queen and King Masters, one in hallway that guests in the Double Twin can use as their own). Lovely, tasteful furnishings and a well-equipped kitchen help you feel at home. The Breakells had made some great updates to siding and new windows since our visit last year, as well. The rooftop deck is where I personally spent so much of my time last week. The view and serenity are not to be missed! Ask Stan about his kayak rental--it's a great 2 person ocean kayak that's perfect for paddling over to the island. Thank you--and looking forward to next year when we might bring the boat, as well! Yes,you should bring your boat next time. I enjoy being able to pull up to the dock, unload and rinse off right there then take the 10 steps to the house. Makes boating fun with no work afterwards! Thanks for staying with us again. Spacious, well furnished, single level house in a quieter, less busy part of Beaufort. Beautiful views and convenient boat access to Taylor creek. Owner (Stan) strives to keep the home well maintained. Great opportunity for our elderly mom and uncle to reconnect after many years, while we enjoyed kayaking and Beaufort's historical attractions. Thanks Willis. I agree that one floor living makes it easy for elderly folks but it also makes it easy for families with children with beach and boating stuff to carry. I like being able to walk out the sunroom door and be on my dock in 10 steps! day to see the lighthouse. Collect shells on Bird Shoal or Carrot Island. Ride bikes anywhere your heart desires (just 5min. to town on bikes). It is a nice 10 minute stroll to the downtown docks. Walk to town, have lunch or dinner and see the million-dollar yachts that stop in Beaufort on their way up and down the Intracoastal Waterway and the great Atlantic. You can go ferrying, kayaking, sailing, walking, bicycling, cruising, shelling, and lounging. You can visit Fort Macon, too. And when no one is looking, you can check your email with free WIFI. excellent shopping, awesome restaurants, and a ferry to the outer islands. This is a quiet vacation spot for couples and families. Just across the draw bridge is a more-active Morehead City, with miniature golf, theaters, malls and all the touristy activity kids sometimes want. 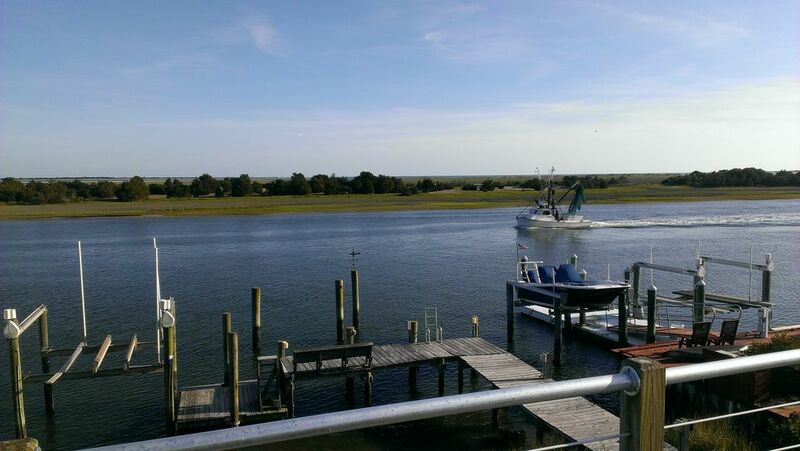 Fishing is excellent and many tournaments are held in Beaufort all year round. Walk or bicycle to the North Carolina Maritime Museum and see Blackbeard the Pirates' recovered artifacts. it up to our deep water access dock! Monthly Rate: contact owner Rental changeover day is Sunday during high season Linens are not provided.